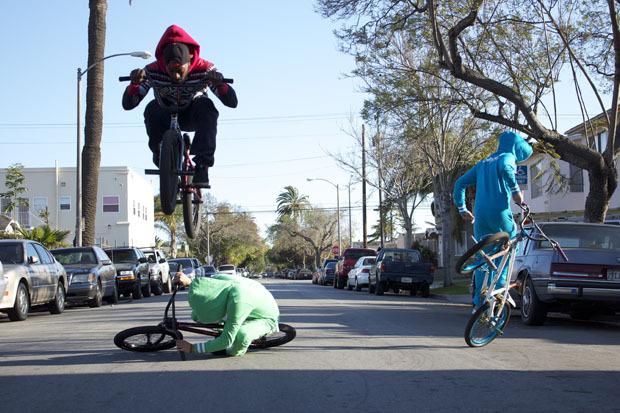 The guys at the Demolition Parts Blog recently jumped in their OnePieces to do some slick bike tricks for this great shot at Long Beach, California. Let’s take a closer look… the guy flying through the air on his bike is wearing a Marius Official OnePiece, the guy lying down on his bike is wearing a Big Print Green OnePiece (you can tell, because of the stripes on the cuffs! ), and finally the guy hopping on his bike is in a Big Print Blue OnePiece. Nice shot, guys! Our attention has been on California for a while, and that’s because there is a new Concept Store opening next week in Los Angeles. The OnePieceBlog has been invited along to get you the pictures and stories from what will undoubtedly be a fantastic opening event. We’ll be asking the President and Co-founder of OnePiece, Martin Adams, to tell the story behind OnePiece‘s success around the world and to leak any exciting news about its future.